‘I am not going to wait’: Berejiklian denies high-speed rail is an election stunt | COMMUNITY ACTION ALLIANCE FOR NSW (CAAN): HOUSING INEQUALITY WITH AUSSIES LOCKED OUT! BUT it clearly is … that is the conclusion drawn on all news reports last night. Premier Gladys Berejiklian has rebutted suggestions her promise to spend $4.6 million planning fast rail in NSW is an election stunt, saying her government could not afford to wait for the federal government before starting work on the scheme. Ms Berejiklian said on Tuesday she would start “work” on a fast rail network in the next term of government after appointing a British rail expert to consider four potential high-speed routes between Sydney and regional centres. But after years and thousands of pages of reports and studies into the viability of high-speed rail on Australia’s east coast, Ms Berejiklian rejected suggestions the pre-election announcement was aimed at marginal seats in the state’s regional areas. Work will start on a fast rail line from Sydney to a NSW regional centre in the next term of government under a promise made by Gladys Berejiklian. “Far from it. This is a government getting on with what it does well,” she said. The four routes the government will ask British rail expert Andrew McNaughton to consider for faster or high-speed rail are from Sydney north to the Central Coast and Newcastle; west to Lithgow, Bathurst and Parkes; south to Wollongong and Nowra; and south west to Goulburn and Canberra. In a further sign her government will seek to distance itself from its federal counterparts during the state election campaign, Ms Berejiklian said she could not wait for the federal government or other states to start work on high-speed rail. “We need to start the work now if we want to see fast rail in NSW. I am not going to wait for the other states and the federal government,” she said. But transport experts say the enormous cost of faster rail or high-speed lines makes it unachievable without a national approach. A new line for high-speed trains from Sydney to Newcastle is estimated at upwards of $40 billion given much of it would have to in tunnels. VIEW: How fast could the proposed fast rail be? While the announcement was scant on detail, Ms Berejiklian said it could involve upgrading existing rail corridors, extending them, or build entirely new rail lines. “I can give you this assurance: we will be starting in the next term of government. It might take us many years to get us to the network we want to build,” she said. But NSW Labor leader Michael Daley said the state’s Liberals had struggled to build a light rail line between Sydney’s CBD and the south east yet “they want us to believe that they can do a fast rail network in the next term of government”. “[It is] absolute pie in the sky stuff from a desperate government in panic mode,” he said. 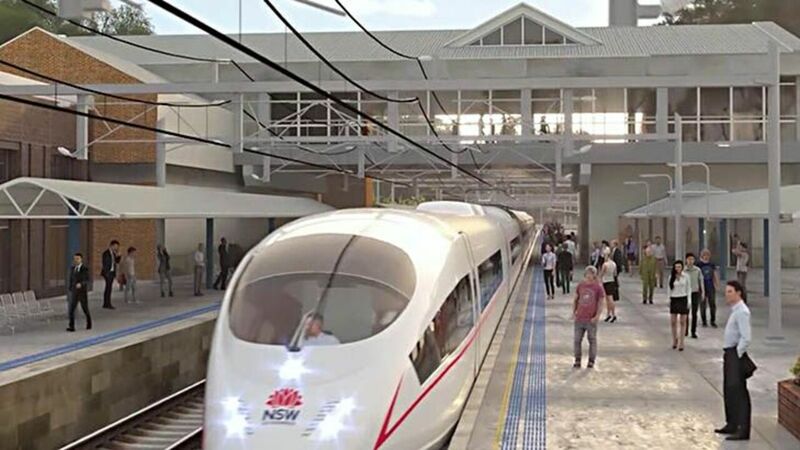 The latest announcement comes five months after NSW Labor promised to commit funding for a study into reducing the four-hour train journey time on the existing rail line between Sydney and Canberra if it is elected to government at the election next March. The Berejiklian government will direct $4.6 million from funds received from the sale of the Snowy Hydro scheme towards the initial planning for high speed rail. Professor McNaughton, who has been involved in the United Kingdom’s High Speed 2 rail project costing nearly $100 billion, said NSW’s topography was not “exactly ideal for very high speed” rail, and it was important to remember that fast rail was expensive and “very fast rail is very expensive”. “It’s not about speed, it’s about time. I am usually asked how fast is fast and the answer is as fast as necessary to … get the choices we want,” he said. He will chair the state panel charged with delivering plans to the government by Christmas next year.